What is Caricature and Caricature entertainment? Editorial cartoons in such as Mad magazine and Al Hirschfeld are examples of caricatures. Caricatures are very popular at parties and special events. Caricaturists styles cross a broad spectrum from mild and almost portrait-like to wildly exaggerated. Guests generally prefer mild then wild. Art Gann’s caricatures are mild and complimentary of each subject. Beauty is in the eye of the beholder, so check out Art’s caricature samples. What should You expect from the Caricature artist? Party caricaturists should be able to render a basic head and shoulder, black & white caricature likeness of a person in 5 minutes or less. They should be professional in handling a variety of people and situations that would occur at parties and special events. (This is learned through experience and Art has over 30 years of entertaining experience). Party caricatures are very specialized. The number of artists that are willing and able to do this work is limited, because the work is demanding and takes years to become proficient. (Not all artists want to give up weekends and holidays when the majority of the events are held). How to know if Caricature Entertainment is appropriate for your event? Caricature artists normally create their drawings on their own portable easels or on a lap board or a table. They draw in progression which is visible to the onlookers who can also watch the person in the “hot seat.” The entertainment is in watching the artist perform, laughing and talking about the caricatures, which opens up communication among guests. A caricaturist can only draw one person at a time, but can place more then one person on the page. Onlookers are watching the artist and being entertained as well. Caricature entertainment can be the center of or accent to any event. Adding to the entertainment appeal, when noise levels or time permits, Art will joke with the audience and converse with the person drawn. Caricature entertainment is popular with guests of all ages. If your event includes both adults and children, like a company party or a family celebration, caricatures work very well. Unlike other types of entertainment, people have something to take home with them. Caricature drawings become cherished mementos for many people. Keeping alive the memory of family events and milestone events such as birthdays, anniversaries, weddings, Bar Mitzvahs, and graduations. We have clients who have Art entertain every year, keeping a gallery and watching how family members change each year in the caricature themes they ask Art to create. 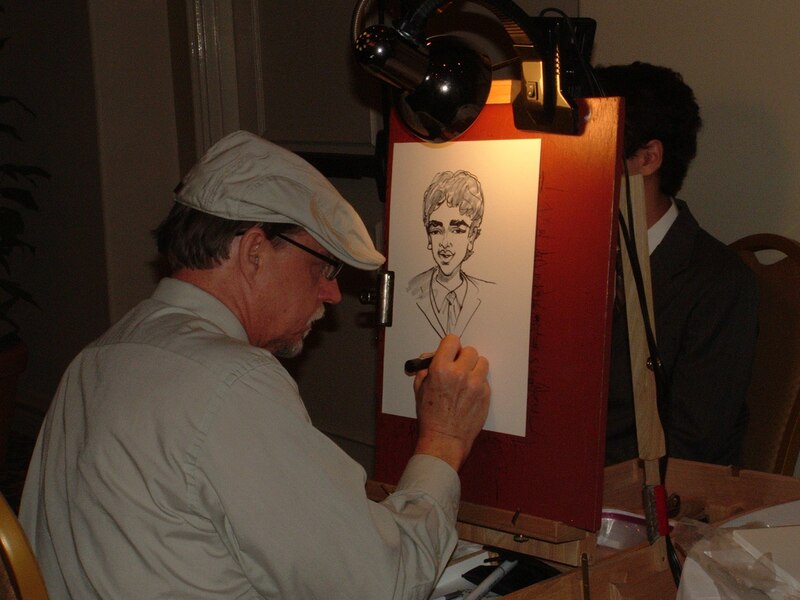 Colleges and universities often book caricaturists to entertain for student and alumni events. Caricature art entertainment provides wonderful conversations during events as your guests will enjoy showing each other their caricatures. An experienced caricature artist should be able to complete a black and white line drawn full face caricature (head and shoulders) of one person in no more than 4-5 minutes. This completion time may vary if the artists adds more detail with tones. Realistically if you have 200 guests and your event lasts 3 hours, one artist is not going to be able to draw everyone in the room. A solution to this is to hire more than one artist. Don’t get too hung up on “how many drawings a caricaturist can draw in an hour”. Caricaturists can control a consistent speed but they can’t control a persons behavior or transition times. Caricaturists set up in a variety of ways. Some draw on a lap board, others use a portable easel or table. They will generally face their subject, who will be facing outwards towards the audience. We provide our own portable lights and only require a power source for darker ambience. You or your venue will be asked to provide two or three chairs, possibly a small table and access to an electrical outlet. If your event is outdoors, place the caricaturist in the shade. This can be done very simply. A large shady tree, a canopy, or a generous overhang are a few solutions. Sitting in the full sun can be hot and uncomfortable to your guests also. The artist will provide his or her drawing supplies and paper. We provide clear plastic bags with a thick cardboard backing to protect the drawings at an additional fee. SEE samples of our clear poly bags. Caricature artists, like other entertainers, base their fees on an hourly rate with an hourly minimum. Rates vary by region. Expect to pay a little more if a third party such as an event planner is making the arrangements on your behalf. (They’re doing research and legwork for you). You’ll be asked for a deposit at the time you sign the contract. We require a $50. non-refundable booking fee for all events that secures an artist for your event. If you need to cancel for any reason this helps to compensate us for holding your date and turning down other bookings. It covers the administration booking costs as well. As with other entertainers, expect to pay more if you want us to hold a rain date because we will be blocking out two dates for you and turning down other clients for two days instead of one. Other charges may include travel outside the artist’s local area, extras such as mats, frames and printing or illustration fees for customizing the drawing paper. See our customized theme bordered paper. If you’re not sure how long you want the artist to stay, book him for the minimum time. Then ask the artist if he will be available for overtime if needed, it will be to his discretions. Caricaturists are generally happy to accommodate you if they are not already booked. Then you’re not locked into a long commitment. If your time requirements are specific, you’ll want to book an artist for that time period. Caricaturists’ schedules can change and with very little notice. By booking for the entire time slot needed, your caricaturist will be committed to your needs. 407-308-5175 to book Art or one of his colleagues for your special event.